Collateral material development for a high-end, private residence building. The Four Seasons Residences Austin provides luxury downtown living with upscale amenities and stunning views of the surrounding city. To sell the remaining available units, the marketing team tapped MODintelechy to craft an event concept and creative direction for corresponding event marketing collateral that aligned with the brand’s high level of prestige. To generate awareness and interest in the remaining residences at the Four Seasons, MODintelechy developed a strategic concept and creative for an event that showcased the units for purchase to prospective buyers. Entitled the Tour d’Arte, partygoers received a "passport" upon arrival and received a stamp at each residence they visited. When guests arrived at the penthouse, the primary party space, those who completed their passports submitted their contact information for the chance to win highly coveted prizes. To maintain the increased level of awareness after Tour d’Arte, MODintelechy developed creative for a series of media placements that included advertisements for both print publications and digital platforms, as well as marketing collateral for the sales team’s use that aligned with the Four Seasons’ brand guidelines. "MODintelechy is our go-to agency for all things creative, handling all of our print and digital marketing campaign design. They are professional and efficient in their work, and have a real knack for listening and delivering beyond expectations." 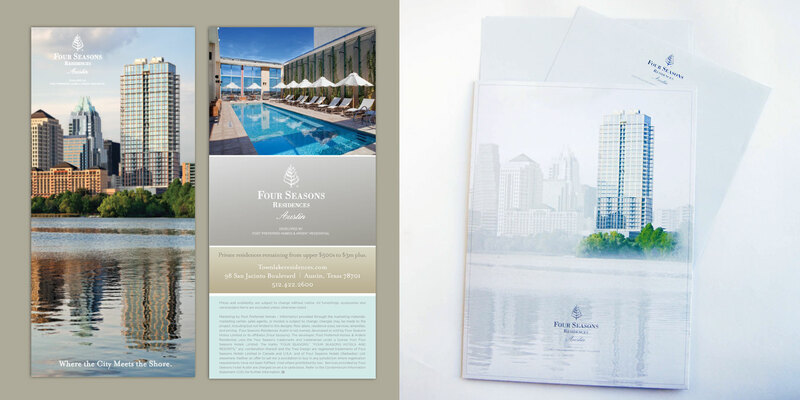 Because of the successful signature event and other strategic marketing initiatives for the luxury real estate brand, the Four Seasons Residences sold out in an unprecedented amount of time.